I think you’re going to see another one soon. Every 15 years, somebody seems to come along with enough money—the USFL in the early 80s, the XFL in the early 2000s—I think we’re probably due in the next couple of years. I know Tom Brady’s agent right now is trying to launch his own version of a league. At the end of the day, the NFL is so big that it becomes difficult to really create a product that all of its fans want. And also, it’s so mainstream that somebody who comes along with an appropriate counter-cultural movement I think will have a lot of success. All you have to do is look at the success of the UFC, and what it did over the last 15 years against professional boxing, to realize that there’s clearly space in this media landscape for someone to come along with a new sports league. The NFL tries to be too many things to too many people, and as a result, they have let their actual product deteriorate to the point where relaunching the XFL isn’t that absurd of an idea given the space being opened by the ineptitude of America’s largest sports league. The NFL has tried to expand its brand beyond the borders of sports, aiming to become “The Shield” while exploiting our nationalism for profit. The problem the NFL now runs into is that modernity has challenged some of the very basic notions of our patriotism (AKA, their business model—the one that has nothing to do with football). — Roger Goodell, the least respected commissioner in sports not named Gary Bettman, opened the session saying “let’s make sure we keep this confidential.” Whoops. — Miami Dolphins owner Stephen Ross, who said his players would be standing for the anthem last month before quickly backtracking on the statement the following day, proposed a “march on Washington” led by NFL players and owners. Yes. Really. These 32 guys are made of 80% water, 20% their own farts. If you were wondering why Colin Kaepernick doesn’t have a job, this is why. He’s the wrong kind of black messenger for these white folk. Kneeling during the anthem revealed how childish and trivial our political debates are, and we are currently enduring the growing pains of a maturing populace. Instead of addressing the players’ contention that Kaepernick is clearly good enough to play in the NFL, so therefore he is getting blackballed over his views, the owners focused on the bad press they have had to endure as a result of the political debates enveloping the league. Rodgers has said he envies the NBA’s culture, which enables athletes to speak more freely about social issues. “The guys who are most vocal in the NBA are the best players,” he says. When I point out that he obviously falls into that category for the NFL, he says he believes that he can say what he wants but that it has to feel “authentic.” He mentions that he’s interested in taking on a role in the players’ union (he used to be a players’ rep), leveraging his unique position to strengthen their cause. The NFL is the most popular league in America, and it reflects our culture. 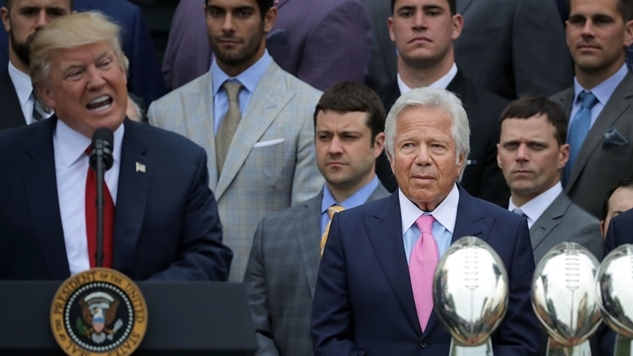 “Distractions” are the chief concern of league executives, but the definition of a “distraction” is completely under the control of those in power. For example, All-pro defensive end Leonard Little played for five more years after getting caught a second time drunk driving—pleading guilty to involuntary manslaughter the first time—while Colin Kaepernick’s career as a starting quarterback lasted just five seasons. These protests are partially intended to demonstrate how the poisonous aspects of the American psyche manifest in political decisions that literally cost lives. We have the power to change our reality, but until the league understands that it is complicit in the “media problem” as described by the hapless Bills owner, then it will never be able to address the core grievances of its employees. This leaked recording of a tense meeting between players and owners doesn’t make it sound like the NFL has any near-term hope of solving one of its most intractable problems, so maybe it will direct its energies in a more realistically productive direction, like finally figuring out what the hell a catch is.